The Beckett Certified Appraisal service allows you to receive a written, printable, certificate with an appraised value derived from extensive research from a Beckett Senior Market Analyst. 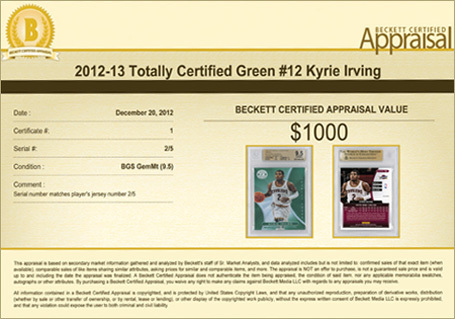 The appraisal is custom tailored to your specific card and is ideal for pricing the scarcest cards, such as 1/1's and other very low print run cards, low population graded cards, and printing and patch variations not otherwise covered in our standard Price Guides..
Why do I need a Beckett Certified Appraisal? All standard issue trading cards, including show versions, print variations, patch variations, and more.